Arranged by Joel Raney. Christmas, Sacred. Set of instrumental parts. Published by Hope Publishing - Digital (H1.87241DP). 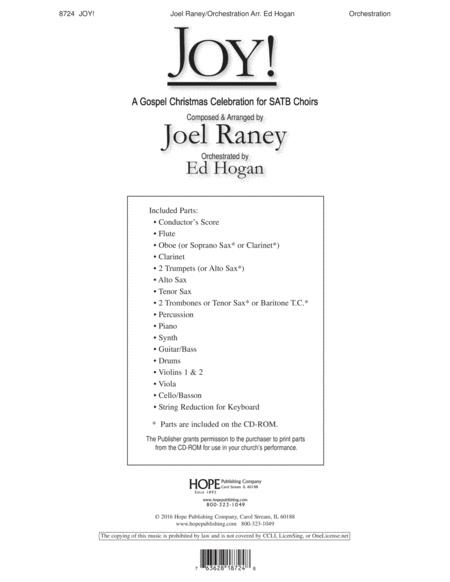 Telling the Christmas story through six dynamic choral settings, Joel Raney brings his masterful ability to compose new and creative rhythms that showcase his grasp of the gospel style to this impactful presentation for SATB choirs. Christmas carols like you've never heard before, all performed with an interspersing of scripture readings. Accompaniment can be provided by just piano, or Ed Hogan's lively orchestration or a smaller set of rhythm parts. Performance time is 25-minutes making this ideal for fitting into a Christmas worship service or as a separate musical program. Orchestrations: Conductor's Score, Flute, Oboe(or Soprano Sax or Clarinet), Clarinet, 2 Trumpets (or Alto Sax), Alto Sax, Tenor Sax, 2 Trombones or Tenor Sax or Baritone T.C., Percussion, Piano, Synth, Guitar/Bass, Drums, Violins 1 & 2, Viola, Cello/Bassoon and String Reduction for Keyboard. Rhythm Parts: Conductor's Score, Percussion, Piano, Synth, Guitar/Bass, Drums and String Reduction for Keyboard. The Publisher grants permission to the purchaser to print parts from the CD-ROM for the use in your church's performance.